This weekend ‘paininthebuttt’ won the Butler’s Special Surprise Promo by winning a truly amazing 152 chat games! Paininthebutt will enjoy a luxury meal for two in a swish Notting Hill restaurant so congratulations to them on their many wins and let’s hope they really enjoy their meal. Butlers Bingo is all about the finer things in life so every week the Special Surprise Promo will boast some luxurious gift or another you just don’t know what until it’s won. One thing I can tell you about the Butler is that he always ensures the luxury prize is accessible to the winner so if you win something it will be brought to you rather than you having to travel to receive it. Butlers Bingo may be on the posh side but that doesn’t mean it will cost you a fortune to play. Great value is just one of the things you will find when you play at Butlers Bingo with tickets starting at as little as 2p. You can also play Free Bingo games every day, these games come with £25 jackpots and you can even pre-buy your tickets if you’re out for the day. 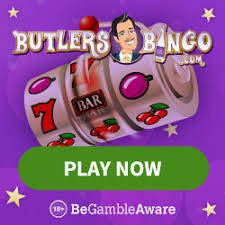 New members who join Butlers Bingo get a £10 free bingo no deposit bonus to get them started plus 150% first deposit bonus as well as 25% on all re-deposits!